Ex-display, excellent condition, Fully Checked & Tested. ---Great condition and fully checked and tested by our engineer ---Colour touchscreen display ---Instant Ink Ready - Print for Free with HP Plans - Details included ---Fast and superb quality printing ---Includes Original Power Lead ---SD Card Slot ---Print directly from your smartphone, tablet and computer (Apple & Android) ---may have slight cosmetic marks. Create borderless, quality, sharp photos with the HP 5530 handy inkjet all in one printer. This printer delivers crisp and detailed images and files with its 1200x1200 dpi scanning resolution. The 8.8 ppm printing speed provided by this black, white and colour model makes printing tasks easy. Connect it to other devices through USB or Wi-Fi. a 2.65-inch touchscreen offers further convenience. This printer gives excellent prints and when printing photos the quality is clearly evident - colours are vivid and the resolution perfectly adequate even for A4 sized photos. 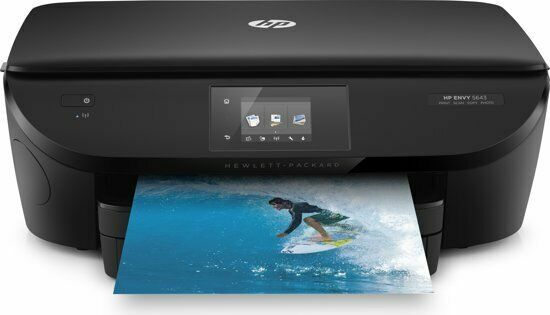 Operation over WiFi is very easy to set up and both the printer and the scanning functions can easily be operated over wireless. Copy functions are easily selected using the small touch screen on the front of the machine. The cartridges for this printer are relatively inexpensive compared to the average. In summary I would say this is an excellent choice as a home office or small office printer. It would not be adequate in a large office or for handling large print runs because the cartridge capacity is not high enough and the print speed (in common with most inkjet printers) is too slow. I have ordered a printer to use occasionally for kids homework. After unpacking, plugging in and trying to make the printer print from my mobile and failing i tried to approach the printing task pressing a few buttons on the printer. And success:) it turns out that the printer needed to be connected to the wifi networkat home first ( ofcourse). I managed scanning a4 drawing ( done by kids) and printing in smaller format - success again:) very useful so far and reasonably small. I haven't tried printing proper photos ( and i don't plan to). For printing few pages a week - sufficient, for printing long documents - slow.